Small-bowel gastrointestinal stromal tumor with a diffusely thickened bowel wall. Gastrointestinal stromal tumor. Image obtained in the same patient as in the previous image. 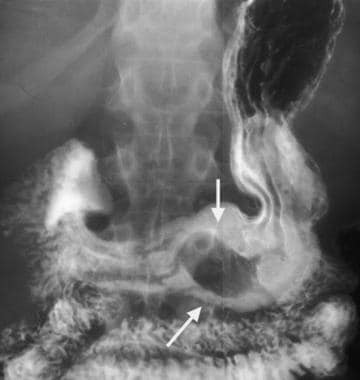 A more caudal portion of the tumor has areas of necrosis (arrows), with air present within the necrotic cavity that communicates with the lumen of the small bowel. The diameter of GISTs, as a whole, can range from a few millimeters to more than 30 cm. Although larger tumors have a higher rate of malignancy, size does not predict benignity, and small GISTs have been known to behave in a malignant fashion. [3, 5] Malignancy is characterized by local invasion and metastases, particularly to the liver. About 10-30% of GISTs have malignant behavior. [1, 2] A benign GIST cannot be conclusively diagnosed, because even small, histologically benign-appearing tumors may later demonstrate clinically aggressive behavior. Factors that are correlated with an improved prognosis include a gastric location, a diameter of less than 2 cm, a low mitotic index, and an absence of tumor spillage with complete gross resection. Gastric gastrointestinal stromal tumor (GIST) en face. 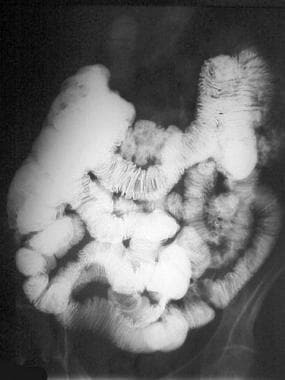 Upper GI image obtained during the single contrast enhancement portion shows an incidentally found mass. The smooth borders suggest a submucosal process. At surgery, a GIST was found. Gastrointestinal stromal tumor. Selective masked injection in the superior mesenteric artery (red arrow) demonstrates a large arterial feeder with tumor staining (white arrows). About 50-70% of gastrointestinal stromal tumors (GISTs) occur in the stomach; 33%, in the small bowel; 5-15%, in the rectocolon; and only 1-5%, in the esophagus. [1, 3, 5, 6, 12, 13] GISTs are multicentric in fewer than 5% of cases (see the images below). Multifocal gastrointestinal stromal tumors. 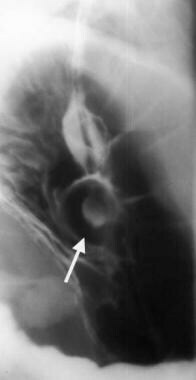 Barium examination reveals a smooth mass that causes narrowing in the second portion of the duodenum (arrows). Gastrointestinal stromal tumor (GIST). CT scan obtained in the same patient as in the previous image shows a focal segment of diffusely thickened ileum, which is another GIST. The aim of radiologic examination is to locate gastrointestinal stromal lesions, evaluate local invasion, and detect distant metastases. The radiographic characteristics of GISTs mirror the gross appearance of these tumors. Small GISTs appear as small, well-circumscribed intramural masses, possibly with overlying ulceration. Larger malignant GISTs appear as complex masses with areas of necrosis, which occur as a result of the tumor's outgrowing its blood supply. Most tumors referred to as leiomyomas and leiomyosarcomas in the older medical literature are actually GISTs. Only with tumors in the esophagus does the term leiomyoma remain accurate. 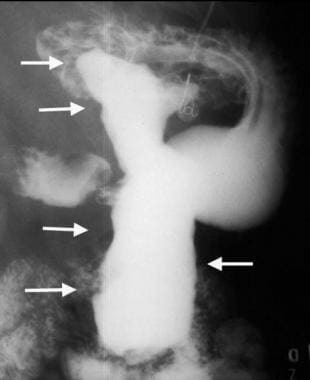 Leiomyomas are the most common mesenchymal tumors in the esophagus; they rarely occur in the stomach and small bowel. In contrast, GISTs are rare in the esophagus, and they are more common in the stomach and small bowel. Regardless of the location of GISTs, barium-enhanced images demonstrate predominantly intramural masses with potential exophytic components. The tumor margins usually are smooth, but with ulceration, some surface irregularity is present. As with other intramural masses, the tumor borders form right or obtuse angles with the adjacent visceral wall. 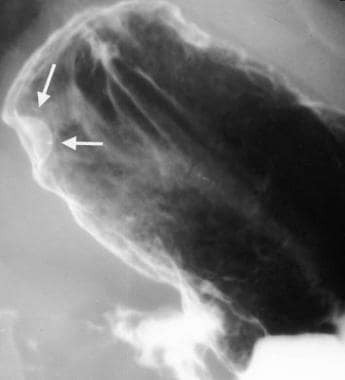 En face, the intraluminal surfaces often have well-defined margins (see the mages below). 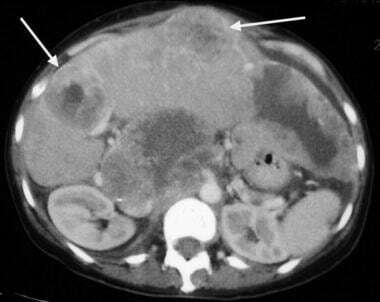 Gastric gastrointestinal stromal tumor in a 49-year-old woman. The mass was found incidentally during an upper GI workup for peptic disease. The smooth appearance suggests a submucosal process. Gastrointestinal stromal tumor (GIST). Image obtained 1 year later in the same patient as in the previous image. The mass has increased in size. A GIST was found at surgery. Gastrointestinal stromal tumor (GIST). 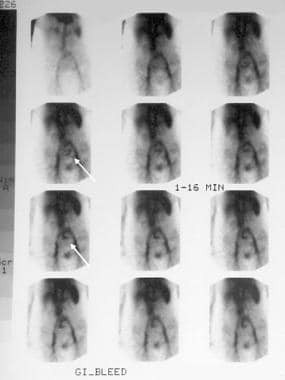 CT scan obtained in the same patient as in the previous image shows the same GIST. It appears as an intramural mass with both exophytic and endophytic components. Because the tumors are intramural but extramucosal, the overlying mucosa may be intact. 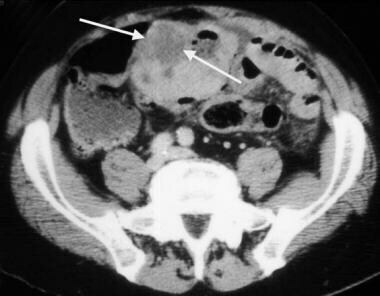 With tumors of the stomach, areae gastricae is preserved over the tumor mass. However, overlying mucosal ulcerations are often present; they are more common in malignant GISTs. These ulcerations fill with barium, causing a bull's-eye or target-lesion appearance (see the image below). Gastrointestinal stromal tumor with central bull's eye appearance, which is compatible with contrast material collection in an ulceration. Gastric gastrointestinal stromal tumor with huge exophytic component, which has become ulcerated. 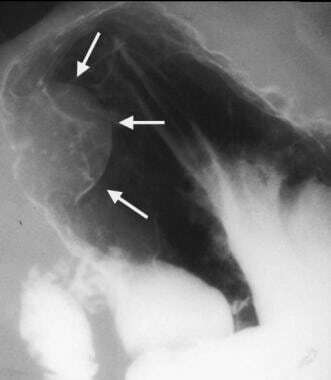 Barium collects in the exophytic ulcer crater (arrows). Gastrointestinal stromal tumor (GIST). 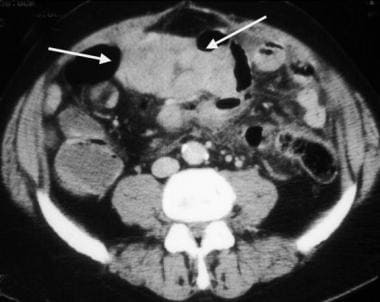 CT scan obtained in the same patient as in the previous image demonstrates the GIST with large exophytic ulceration (arrows). At times, the mass is entirely exophytic and, thus, is not appreciated during contrast-enhanced examination. 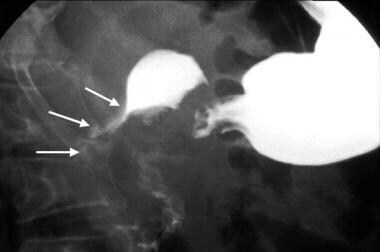 Barium images outline the intraluminal portion of this tumor; frequently, a substantial exophytic extension is present (see the images below). Proximal jejunal gastrointestinal stromal tumor that is completely exophytic and not visible at small-bowel barium examination. Gastrointestinal stromal tumor (GIST). 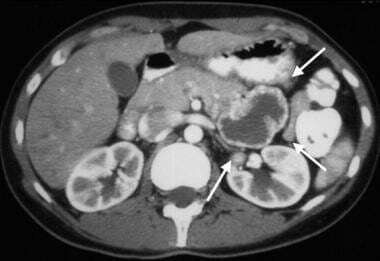 Contrast-enhanced CT obtained in the same patient as in the previous image demonstrates a peripherally enhancing mass immediately adjacent to the pancreas that was thought to be a pancreatic neoplasm. However, at surgery, this proved to be a proximal exophytic jejunal GIST. CT for GISTs should be performed with both oral and intravenous contrast materials. 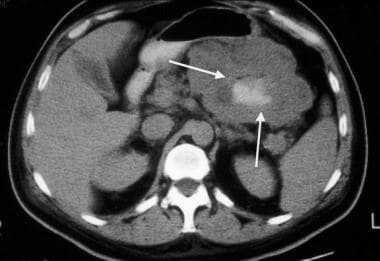 CT is ideal in defining the endoluminal and exophytic extent of tumor. Smaller gastrointestinal stromal tumors appear as smooth, sharply defined intramural masses with homogeneous attenuation (see the images below). With contrast enhancement, the tumor may appear to have a rim, or it may be uniform in appearance (see the images below). Occasionally, dense focal calcifications are present. Larger GISTs with necrosis appear as heterogeneous masses with enhancing borders of variable thickness and irregular central areas of fluid, air, or oral contrast attenuation that reflect necrosis (see the images below). Overlying mucosal ulcerations may be present, and the tumor may extend into nearby structures. 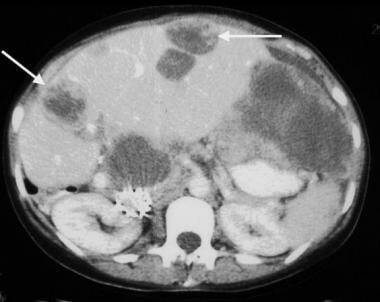 Small-bowel gastrointestinal stromal tumor with multiple liver metastases (arrows). Gastrointestinal stromal tumor. Image obtained in the same patient as in the previous image after imatinib mesylate (Gleevec) administration. 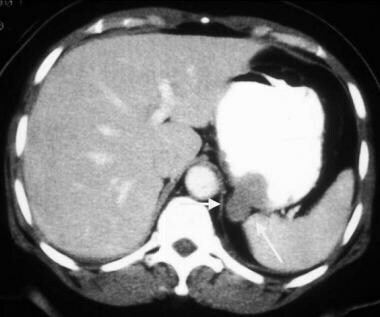 Note the decreased size of the liver metastases. Gastrointestinal stromal tumor (GIST). CT demonstrates a complex mass originating from the small bowel with characteristics of a GIST. Among imaging studies, MRI has the best tissue contrast, which aids in the identification of masses within the GI tract. Furthermore, the ability to image in multiple planes facilitates localization and diagnosis. Intravenously administered contrast material is needed to evaluate lesion vascularity. Ultrasonography is only moderately sensitive for the detection and evaluation of gastrointestinal stromal tumors. Bowel gas and acoustic shadowing obscure portions of the bowel and mesentery. Ultrasonography is ideal for guided-needle biopsy of known lesions, if such a procedure is indicated. With immunohistochemical staining methods, the diagnosis may be made before surgery. However, aspiration (eg, fine-needle aspiration) and biopsy should be used selectively because of the risk of tumor seeding or peritoneal spillage. [3, 26] Both are associated with a worse prognosis. Gastrointestinal stromal tumor. A 62-year-old women presented with 2 episodes of massive GI bleeding. 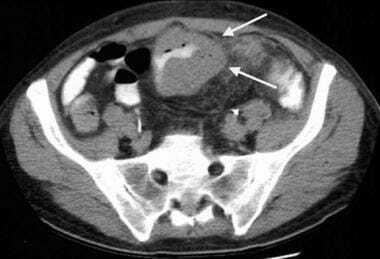 Nuclear medicine GI bleed scanning demonstrates increased tracer activity in the mid abdomen (arrows) consistent with a small bowel active bleed. Courtesy of Dr Jon Wood and Dr John McDermott, University of Wisconsin Hospitals and Clinics. Gastrointestinal stromal tumor (GIST). 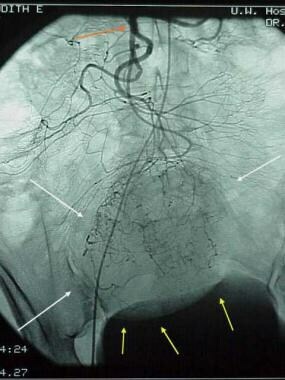 Patient in the previous image then underwent angiography, which demonstrates a mass (white arrows) in the same location as the small-bowel bleed. The blood supply is from the superior mesenteric artery (red arrow). 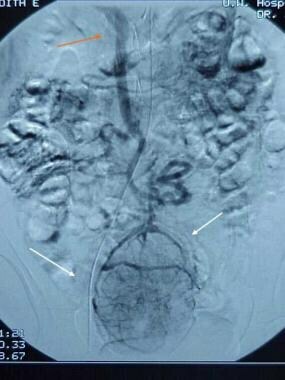 Minimal mass effect on the bladder is noted (yellow arrows). Findings are consistent with a small bowel mass, which stained positive for CD117; this result is consistent with a GIST. Gastrointestinal stromal tumor. 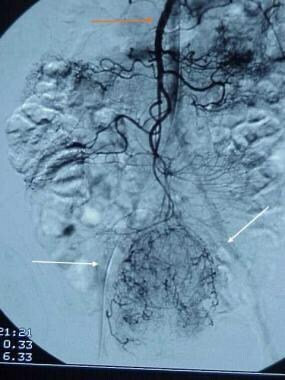 Delayed images demonstrate large draining vein, which empties into the superior mesenteric vein (red arrow). Gastrointestinal stromal tumor. Enteroclysis results were surprisingly normal. No abnormalities are seen, and no significant mass effect suggests the presence of the mass. Nishida T, Hirota S. Biological and clinical review of stromal tumors in the gastrointestinal tract. Histol Histopathol. 2000 Oct. 15(4):1293-301. [Medline]. Pidhorecky I, Cheney RT, Kraybill WG, Gibbs JF. Gastrointestinal stromal tumors: current diagnosis, biologic behavior, and management. Ann Surg Oncol. 2000 Oct. 7(9):705-12. [Medline]. Arleo EK, Schwartz PE, Hui P, McCarthy S. Review of Leiomyoma Variants. AJR Am J Roentgenol. 2015 Oct. 205 (4):912-21. [Medline]. 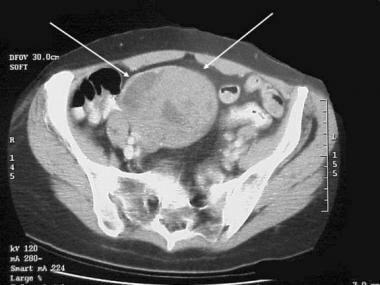 Lehnert T. Gastrointestinal sarcoma (GIST)--a review of surgical management. Ann Chir Gynaecol. 1998. 87(4):297-305. [Medline]. DeMatteo RP, Lewis JJ, Leung D, et al. Two hundred gastrointestinal stromal tumors: recurrence patterns and prognostic factors for survival. Ann Surg. 2000 Jan. 231(1):51-8. [Medline]. Pierie JP, Choudry U, Muzikansky A. The effect of surgery and grade on outcome of gastrointestinal stromal tumors. Arch Surg. 2001 Apr. 136(4):383-9. [Medline]. Miettinen M, Sarlomo-Rikala M, Sobin LH, Lasota J. Esophageal stromal tumors: a clinicopathologic, immunohistochemical, and molecular genetic study of 17 cases and comparison with esophageal leiomyomas and leiomyosarcomas. Am J Surg Pathol. 2000 Feb. 24(2):211-22. [Medline]. Lasota J, Jasinski M, Sarlomo-Rikala M, Miettinen M. Mutations in exon 11 of c-Kit occur preferentially in malignant versus benign gastrointestinal stromal tumors and do not occur in leiomyomas or leiomyosarcomas. Am J Pathol. 1999 Jan. 154(1):53-60. [Medline]. Tazawa K, Tsukada K, Makuuchi H, Tsutsumi Y. An immunohistochemical and clinicopathological study of gastrointestinal stromal tumors. Pathol Int. 1999 Sep. 49(9):786-98. [Medline]. Betz M, Kopp HG, Spira D, Claussen CD, Horger M. The benefit of using CT-perfusion imaging for reliable response monitoring in patients with gastrointestinal stromal tumor (GIST) undergoing treatment with novel targeted agents. Acta Radiol. 2013 Sep 1. 54(7):711-21. [Medline]. Berman J, O''Leary TJ. Gastrointestinal stromal tumor workshop. Hum Pathol. 2001 Jun. 32(6):578-82. [Medline]. Kim HC, Lee JM, Choi SH, et al. Imaging of gastrointestinal stromal tumors. J Comput Assist Tomogr. 2004 Sep-Oct. 28(5):596-604. [Medline]. Cichoz-Lach H, Kasztelan-Szczerbinska B, Slomka M. Gastrointestinal stromal tumors: epidemiology, clinical picture, diagnosis, prognosis and treatment. Pol Arch Med Wewn. 2008 Apr. 118(4):216-21. [Medline]. Shojaku H, Futatsuya R, Seto H, et al. 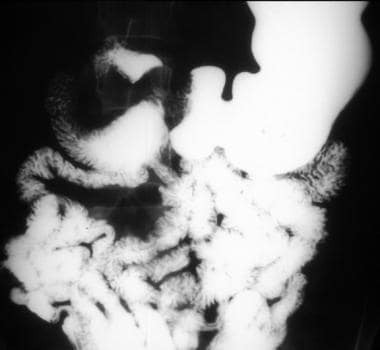 Malignant gastrointestinal stromal tumor of the small intestine: radiologic-pathologic correlation. Radiat Med. 1997 May-Jun. 15(3):189-92. [Medline]. Levine MS, Buck JL, Pantongrag-Brown L, et al. Leiomyosarcoma of the esophagus: radiographic findings in 10 patients. AJR Am J Roentgenol. 1996 Jul. 167(1):27-32. [Medline]. Ishii T, Kuyama Y, Obara M. Gastrointestinal stromal tumor of the stomach. Intern Med. 1997 Jun. 36(6):392-7. [Medline]. Jiang ZX, Zhang SJ, Peng WJ, Yu BH. Rectal gastrointestinal stromal tumors: imaging features with clinical and pathological correlation. World J Gastroenterol. 2013 May 28. 19(20):3108-16. [Medline]. [Full Text]. Milliron B, Mittal PK, Camacho JC, Datir A, Moreno CC. Gastrointestinal Stromal Tumors: Imaging Features Before and After Treatment. Curr Probl Diagn Radiol. 2015 Aug 7. [Medline]. Buckley JA, Fishman EK. CT evaluation of small bowel neoplasms: spectrum of disease. Radiographics. 1998 Mar-Apr. 18(2):379-92. [Medline]. Tervahartiala P, Halavaara J. Radiology of GIST. Gastrointestinal stromal tumours. Ann Chir Gynaecol. 1998. 87(4):291-2. [Medline]. Lin G, Yang LY, Huang YT, Ng KK, Ng SH, Ueng SH, et al. Comparison of the diagnostic accuracy of contrast-enhanced MRI and diffusion-weighted MRI in the differentiation between uterine leiomyosarcoma / smooth muscle tumor with uncertain malignant potential and benign leiomyoma. J Magn Reson Imaging. 2015 Sep 18. [Medline]. Sato K, Yuasa N, Fujita M, Fukushima Y. Clinical application of diffusion-weighted imaging for preoperative differentiation between uterine leiomyoma and leiomyosarcoma. Am J Obstet Gynecol. 2014 Apr. 210 (4):368.e1-8. [Medline]. Seidal T, Edvardsson H. Diagnosis of gastrointestinal stromal tumor by fine-needle aspiration biopsy: a cytological and immunocytochemical study. Diagn Cytopathol. 2000 Dec. 23(6):397-401. [Medline]. Duffaud F, Blay JY. Gastrointestinal stromal tumors: biology and treatment. Oncology. 2003. 65(3):187-97. [Medline]. The authors and editors of eMedicine gratefully acknowledge the contributions of previous author Andrew Taylor, MD, to the development and writing of this article.